The Lockey digital combination lock 3781 is an Electronic Push button cam lock. 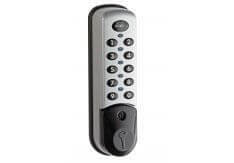 This standalone battery operated lock allows the user immediate and simple keypad access without the need for a key. Users have the flexibility to set and change their personal entry code whilst a preset master code ensures that supervisor access is always available or in an emergency use the key override. in swimming pools, gyms, health centres or spas. With all the standard features you would expect from an electronic lock, plus many others. The 3781 wet area lock is also compatible with the RAS remote allocation system.